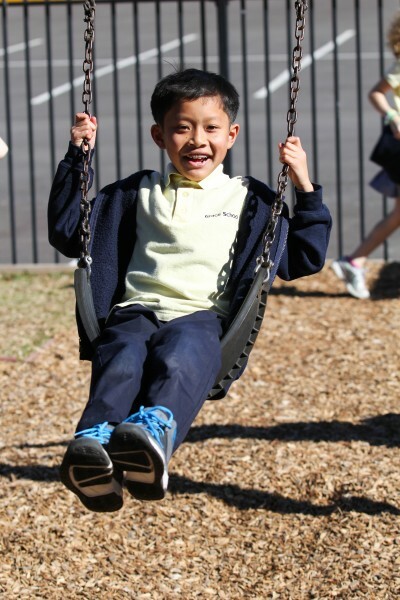 The Outdoor Space at Grace has become an essential component of student life at Grace Lower School. Students look forward to spending time in a space specifically designed to encourage exploration, collaboration, and adventure. Nestled among massive live oak and pine trees, the Outdoor Space at Grace is a true sanctuary located in the heart of the nation’s third largest metropolis, Houston, Texas. All kindergarten through fifth grade students have eight unique areas specifically designed to encourage students to build, create, collaborate and play. The building area houses a wide variety of loose parts, providing opportunities for students to safety change their environment into a play space of their very own. The large open space is filled with the sounds of laughter and group games, while the musical instruments provide a calming space for students and massive sand pit is home to digging and sifting adventures. The garden area allows students to experience the joy of caring for their own plant. From sowing seeds, to watering, weeding, harvesting and tasting, students have a strong understanding of what it takes for that plant to survive. The Outdoor Space at Grace is open to students throughout the school day as well as visitors on weekends throughout the year. What an amazing opportunity for community members to fellowship, discover the value of nature, and explore together! Neighboring schools and organizations have also planned visits in order to garner inspiration and ideas to create and/or redesign their own nature based spaces. This beautiful space consists of plants native to South Texas and is easily maintained via a lawn service company and sprinkler system. The Outdoor Space at Grace was fully paid for by the fundraising efforts of school families. The Outdoor Space at Grace has encouraged cross age relationships and has become a powerful mentoring medium for Lower School students. Fifth grade students have taken on a leadership role, becoming campus recess coaches with the sole purpose of promoting play and teamwork with the school’s youngest students. Administrators and teachers have taken note of the tremendous impact these student-mentoring relationships have had on the school’s vision to inspire thoughtful, compassionate students eager to engage in the world around them.